June 20th production canning results of: “Signature Strawberry Salsa” and strawberry-lemon concentrate. Thursday evening four canners with Diane Devereaux leading the session processed “Signature Strawberry Salsa” and a strawberry-lemon concentrate. Input: We had at least four flats of strawberries and enough of the minor ingredients for quadruple batches of “Signature Strawberry Salsa” and one and a half batches of the strawberry-lemon concentrate. Production results: 43 processed pints of “Signature Strawberry Salsa”, 7 processed pints of strawberry-lemon concentrate, 2 pints of unprocessed (to be refrigerated) concentrate, and 5 bags of frozen strawberries. The strawberry salsa may be eaten with chips or poured over pork, chicken, or cheese. The concentrate may be a drink mix with club soda, or used as a smoothie starter, or a daiquiri starter. Both recipes are quite versatile. Next week’s planned production is for the last of strawberry season and the beginning of cherry season. Possible choices to preserve include more salsa or drink concentrate, cherry pie filling, maraschino cherries, canned cherries, or jam. 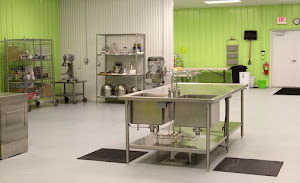 To reserve your space in the June 27 canning line, go to www.canningdiva.com to sign up on-line. You bring your ingredients and jars and we provide the tools, the facility, the cleanup, and The Canning Diva leading the session to bring order and increase output. The Canning Diva’s “Signature Strawberry Salsa” recipe is also available on her site. Tune in next week for the results of canning production for Thursday, June 27.